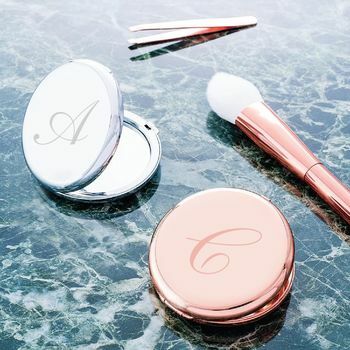 The Personalised Hand Mirror is a beautiful silver or rose gold compact featuring a monogrammed initial with a gorgeous polished finish. This pocket sized companion is perfect for checking your summer hair style or gifting to a bride-to-be. Available in silver or rose gold, this mirror can be personalised with an engraved initial of your choice. Why not add engraving on the inside? Add up to 50 characters including dates, names and special messages. Perfect for popping in your handbag!